2013 CHS Solved Question Paper class 6 SET BHU: are you looking for CHS Class 6 old question papers or solved question papers of Central Hindu School, BHU? I am publishing CHS old question Paper class 6 SET 2013 BHU along with the answer key. BHU School Entrance Test (BHU SET) is conducted to provide admission in the CHS (Central Hindu Boys School and Central Hindu Girls School. BHU SET is national level entrance exam organized by the Controller of examination, BHU. It is conducted once in a year in the month of May –June. This year, BHU SET was conducted between 16 May 2017 – 20 May 2017 in two meetings (1st Meeting Timing: 08.00 a.m. onwards 2nd Meeting Timing: 3.00 p.m. onwards. 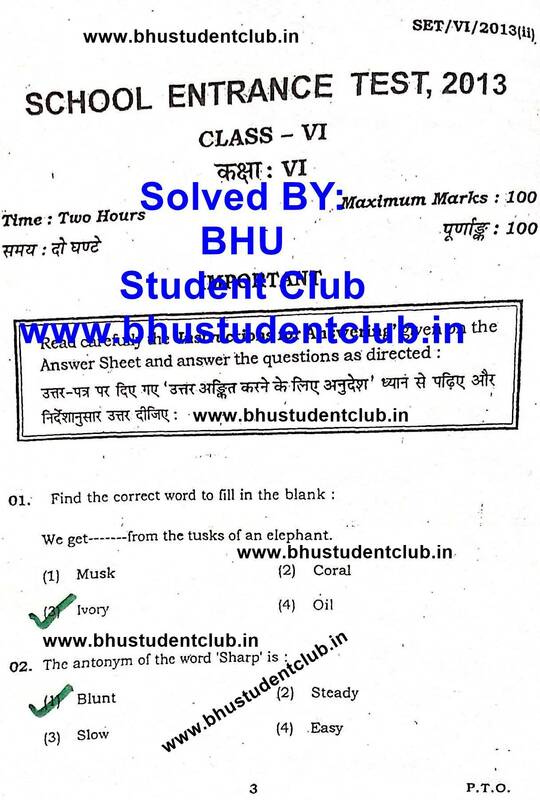 In this article, we have updated the information regarding to the BHU CHS BHU SET Class 6 solved paper 2013. Once I remind you if you are going to appear in the next SET Test, then you should Read the last year’s papers and answer key available on our website. You can get it from our main navigation menu.